We travel. A LOT! And we bring our Montessori materials and concepts along with us. 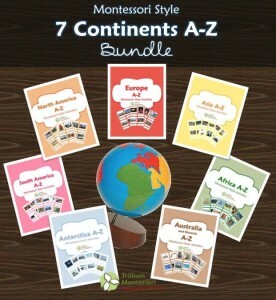 This edition of the 12 Months of Montessori Learning is going to focus on Montessori while traveling! 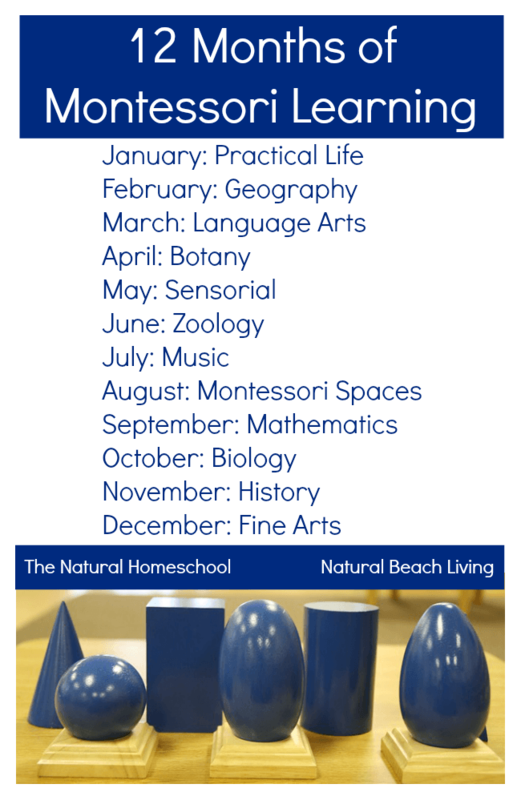 Our 12 Months of Montessori Learning series continues this month with a tour of Montessori Spaces. I know you are going to love all the posts so don’t forget to check out all the links at the bottom of this post to all the other amazing Montessori bloggers. The first time I took a long trip with my son it was a cross country flight and he was 8 weeks old. My daughter was 6 weeks old on her first flight! We are a get up and go kind of family and our military life has helped us fund several of our moving adventures. Not only do we travel for vacation or education, we move to a new home way to often. My family and I just completed our 14th move in the last 7 years. Yes, that is WAY to much! But each time we move, we get to recreate our Montessori setup and find new ways to help our growing children learn. 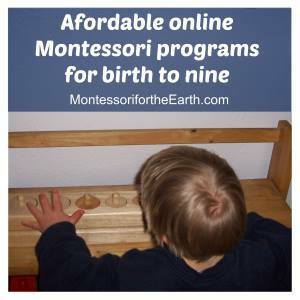 I have done Montessori while traveling posts in the past on Montessori on a Budget and I have showcased our Small Space Montessori Living on Trillium Montessori. But this time I want to give you a little glimpse of our RV life and some amazing resource for you to be confident in your own Montessori while traveling. This is our first time transitioning into an RV while we move from one house to the next. There is a HUGE financial benefit to living in an RV for a short while in order to research and go through the buying process for a new home. After only a couple weeks in our full time RV living I LOVE it. 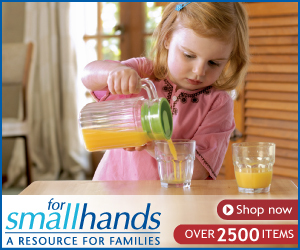 We are able to spend more intimate time with the kids and cleaning is significantly reduced! 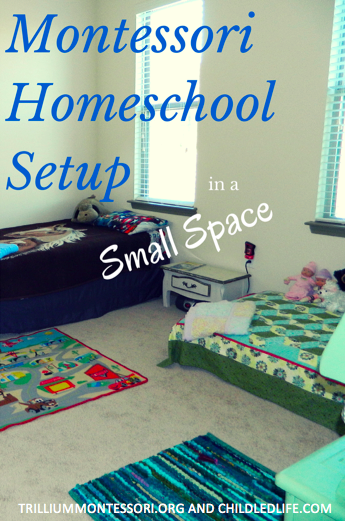 I want to highlight a couple areas that really make our RV living easy for our Montessori children. Both of them have used the Montessori method from birth. I know they are capable of preparing their own food and find their own educational entertainment. 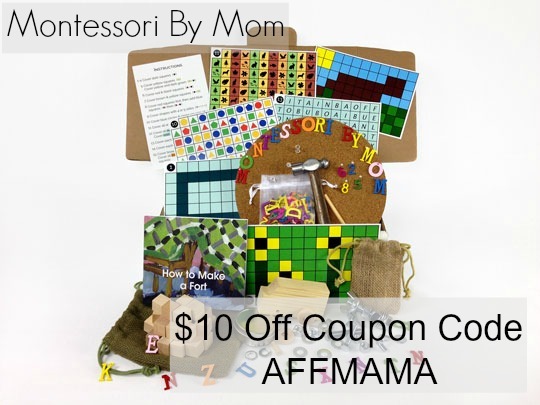 As a Montessori parent, I am here to facilitate that independence through our at home setup. 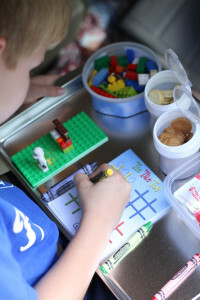 The first must have for Montessori while traveling in an RV is a folding step stool. One of the things I love most about the Montessori method is my children’s independence. I want to keep that going even though our space may be limited. 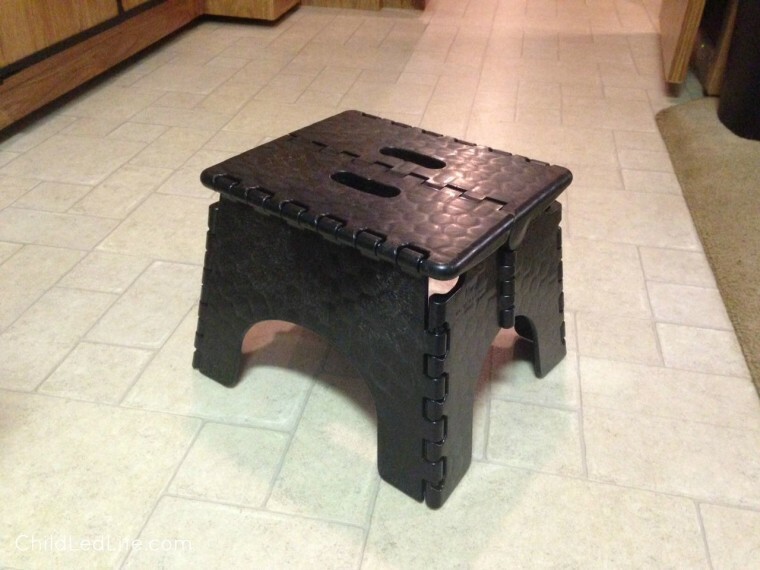 Our step stool holds up to 300 pounds and folds up flat for easy storage. We keep ours in our main living space so the kids have access to it for any of their needs. 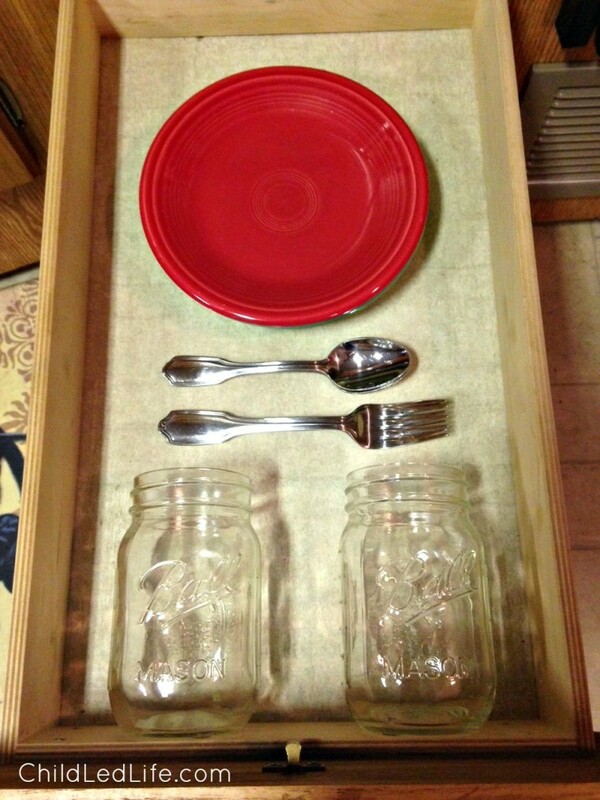 Next, I reserved one of the few drawers we have for the kids cups, plates, and silverware. This is another easy way to facilitate independence. Both kids are able to open the refrigerator to prepare their own drinks and food. Last, I want to give you a little glimpse into our entertainment. 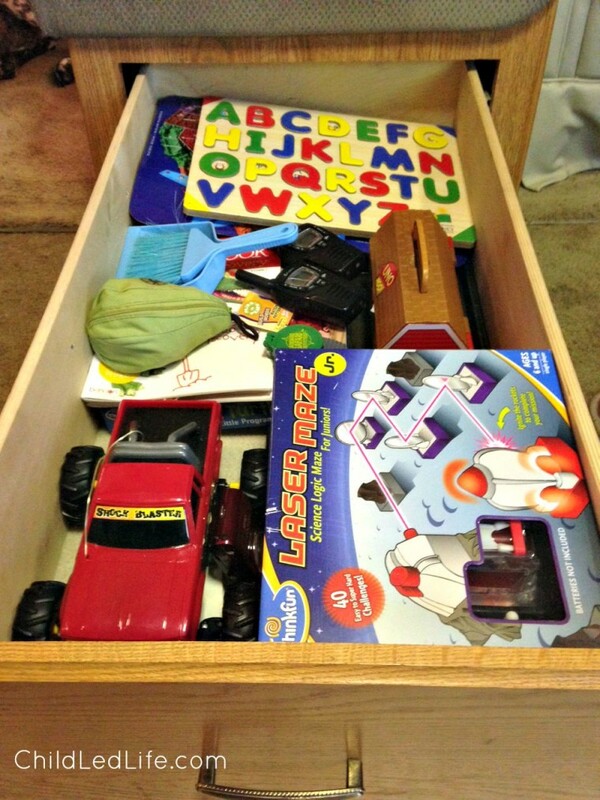 To be clear, the Montessori method would not support a toy bin like this. But remember our family of 4 now lives in a 34 foot RV for full time living. So this is is how I make this work for my family. 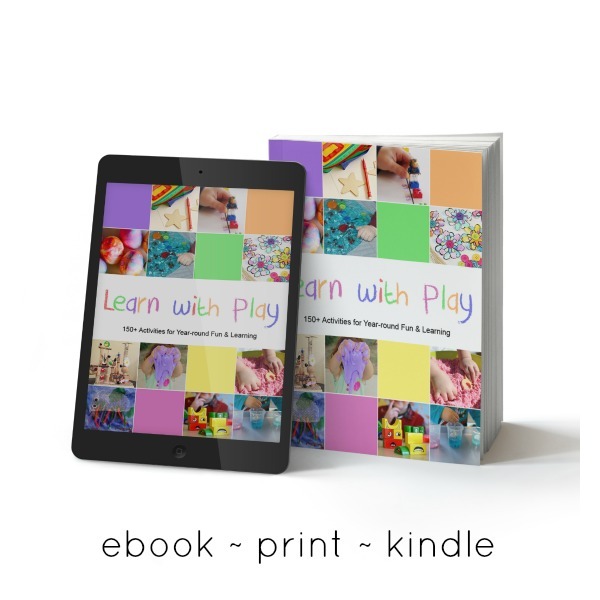 I have pre-selected a series of engaging games and materials my kids use most often. They are able to pull open this drawer which was added after market to the space under our dining benches. We also have one book basket, a space dedicated to Samuel’s love for Lego, and a small collection of trays and work rugs. Each of these little ways of life help my kids feel at home in with our Montessori while traveling environment. I dedicated two cabinets in our RV for a selection of art and sensory materials. These can be rotated and I pull them out on request. I took a long time while we were packing to make rotating Montessori materials and toy boxes. Our storage unit is very close so when the kids are ready for a rotation I can go find the next box and have a while new set of materials pre-selected. It took a good amount of time to do while packing the house before the movers came, but in the long run will save me a lot of time! Another area I’m very proud of, but had a hard time getting good pictures with the drawer position and light, is the kids clothes drawers. They each have two low drawers for their clothes. They are able to pick out clothes and dress without assistance from me. 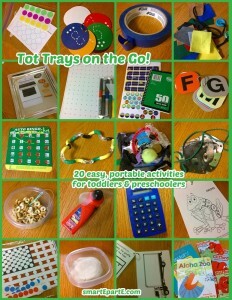 I really love this Magnetic Snack and Play Travel Tray on I Can Teach My Child To Ready! We keep 2 baking sheets in the car at all times. They are great work surfaces while on the go! Alphabet Wallet Cards and Color and Shape Wallet Cards are great additions to Montessori while traveling concepts. They are easy to use and are durable to stand the tests of the traveling life! I really like this list of ideas on Encouraging Learning about Diversity from Code Name: Mama. Exploring new towns and cities is how the kids and I spend a lot of our time when we finish a move. We like to visit all the parks in the area and talk with parents we meet there about the best attractions to visit and any areas of town we should avoid. Keeping Young Kids Entertained While Traveling on Be A Fun Mum lists several fun idea like music selections, food choices, and special sensory items to keep young kids entertained. 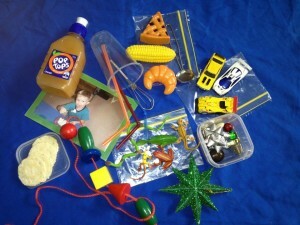 Putting together Activity Kits, like they have on Counting Coconuts, is a great way to keep materials organized. I really love the set of CVC cards featured! On my post Mommy Hacks for Traveling with Kids, I walk you through one of our 6 hour trips to the beach. 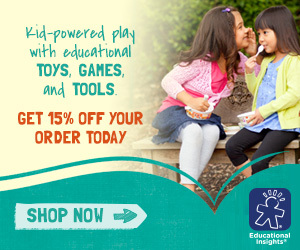 You’ll find ideas on snacks, games, and a great way to pass the time while making learning fun! 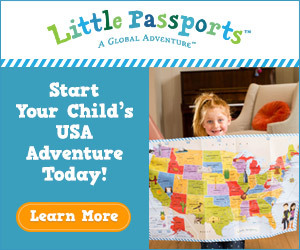 Travel Tot School! 20 Idea While On The Go on SmartE PartE brought up a couple creative ideas I have never thought of! Painters tape, easy DIY activities, and a magnetic oven. It’s a great way to mix it up as you travel more with your kids! Need some ideas on what to take while traveling with kids? I have a great collection of ideas on my post The Best Advice for Travel with Kids. 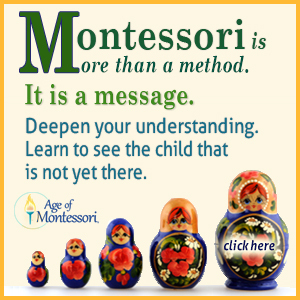 Click on the links below to visit all the other Montessori Inspired posts from the participating bloggers. I have wanted to sell our house and live in an RV for the longest time! I’m so glad you’re enjoying it. 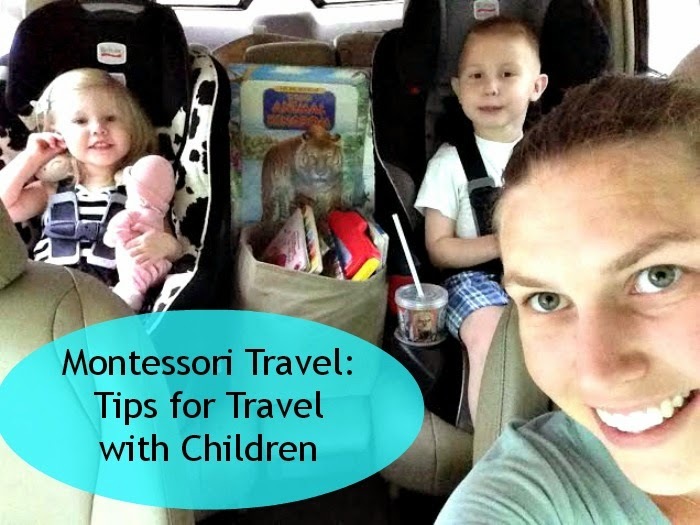 You have some great ideas here about using Montessori while traveling. Thank you for taking the time to share them all! Oh my goodness – I was just bemoaning the fact I didn’t have enough space to store all of our activities and crafts and stuff – and here you are doing it in an RV! Wow! Taking some of your tips here and going to try and put them into practice. 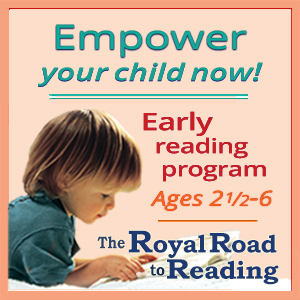 Kristin @ smartEpartE.com’ last post was: 16 Water Preschool Trays! I’m sure you will find it interesting to live in a small space. I always think it is a good thing to do for a while so we can see just how much “stuff” we can live without. You have some good tips here – thank you for sharing. Pinned! This is a dream of mine and I love seeing how you make it work so well. Awesome!!!! I can tell that you really thought out the entire moving process and how to keep the Montessori education continuing while traveling. Thank you for making it simple and do able. I truly appreciate your unique approach to a Montessori space. 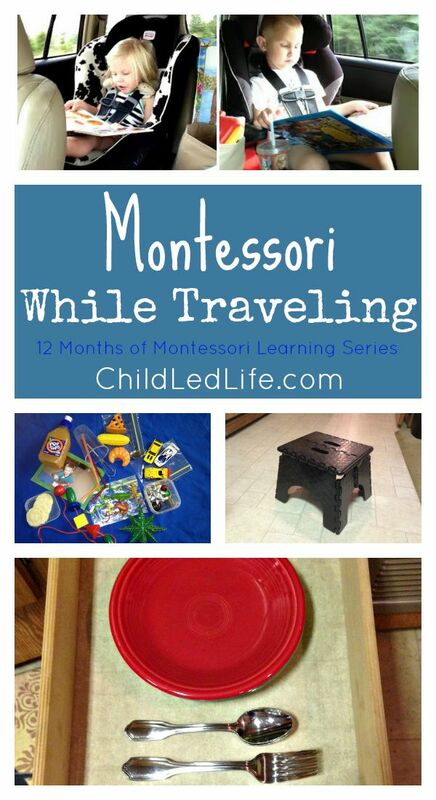 You have found some amazing ways to incorporate Montessori with your life on the road. You always have an abundance of great resources. I love the magnetic tray and the tips on diversity while traveling. This is amazing — it shows that Montessori is universal and can be adapted to any size, culture, religion, etc. You have put so much thought into this, I can tell! Simply amazing! Thank you, Elaine! I appreciate you stopping by.